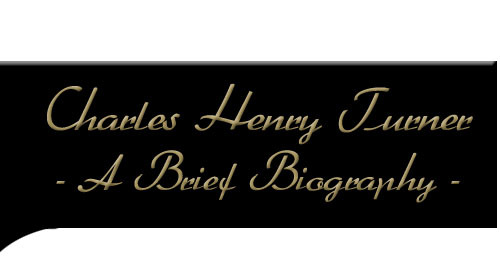 This paper presents a brief biography of Charles Henry Turner and outlines some of his contributions to the study of honey bee behavior. In addition to making a new generation of beekeepers aware of Turner’s many contributions, I hope this sketch will serve as a source of inspiration to stimulate both minority students and students from disadvantaged backgrounds to enter the world of beekeeping and to learn more about this exceptional scientist. Charles Henry Turner (1867-1923) was a pioneer of the comparative psychology and animal behavior movement in America and one of the most influential scientists working on problems of comparative behavior from the late 1890s through the early 1920s. Trained as a zoologist, his research focused on questions concerning behavior. His contributions included the development of techniques to measure learning and other types of behavior of several invertebrate species (some of these techniques are still used more then 70 years after their invention), placing an emphasis (unique at the time) on how training variables such as intertrial interval, intersession interval, individual differences and age of subjects influence performance, publishing 70 scientific papers, and initiating the first controlled studies of color vision and pattern vision in honey bees. In addition to his behavioral work, Turner also published extensive anatomical studies of both the avian and crustacean brain, discovered a new species of aquatic invertebrate, and wrote on social and educational issues of the day. In regards to the latter topic, Turner was a leader in the civil rights movement in St. Louis, MO and was instrumental in developing social services for African-Americans in the St. Louis area. Turner was born two years after the civil war on February 3, 1867 in Cincinnati, Ohio. His father was a church custodian and his mother a practical nurse. Highlights of his scholastic life included being selected as valedictorian of his high school class, earning his B.S. degree in Biology from the University of Cincinnati, and becoming the first African-American to be granted a Ph.D. from the University of Chicago. Upon receiving his doctorate, Dr. Turner could not secure an academic appointment at the University of Chicago despite having published over 30 papers. This included the first paper by an African American in the prestigious journal Science. He was also turned down for an appointment by Booker T. Washington, president of Tuskegee Institute, because Washington could not afford to pay the salaries of both Dr. Turner and Dr. George Washington Carver. As a result, Dr. Turner spent much of his early academic career moving from high school to high school before settling at the age of 41 in Sumner High School (St. Louis, Missouri). He would remain at Sumner until his retirement in 1922 at age 55. While at Sumner High School Dr. Turner continued to publish. His publication rate of two articles per year exceeded most of his contemporaries working at colleges and universities. His achievements are made even more remarkable when one considers that he worked with unconventional organisms that required mastery of a wide range of rearing techniques. These animals included various species of ants, bees, cockroaches, crustaceans, moths, pigeons, spiders, and wasps. Dr. Turner also did work with plants. Moreover, many of his papers included investigations of several species within the same manuscript. Consider also that throughout his career he had few or no formal laboratory facilities, no easy access to research libraries, no opportunity to train research students at the undergraduate or graduate level, heavy teaching loads, low pay, and restricted laboratory time. In regards to the latter, many of his experiments were run in the summer and/or in the evenings when the opportunity presented itself. One of the best examples of Turner’s behavior work is his studies of color and pattern vision in the honey bee. Turner’s honey bee work is today all but forgotten in the honey bee literature. For both papers, elaborate apparatus was constructed and controls were implemented that conclusively showed that honey bees can perceive both color and pattern. The rationale behind the color vision paper (1910, Experiments on color-vision of the honey bee, Biological Bulletin, 19, 257-279) was to provide data under controlled conditions on the ability of bees to see color. Such experiments were theoretically important because of the perceived interactions between honey bees and flowers. Professor Turner begins the paper with a scholarly review of the literature (this literature review is invaluable to honey bee researchers in its own right) in which the various theories of why bees should see colors is enumerated, followed by a discussion of the limitations of the existing data. To investigate the problem, he studied honey bees in O’Fallon Park in St. Louis. He designed various colored disks, colored boxes, and “cornucopias” into which the bees were trained to fly. Thirty-two experiments were designed, and controls for the influence of odor and brightness were instituted. The results of his experiments showed that bees can see colors and discriminate among them. It is interesting that in considering the results of his experiments, he believed that bees may be creating, in his words, “memory pictures” of the environment. The idea of memory pictures is certainly contemporary. The second paper of the series on honey bee learning (1911, Experiments on pattern vision of the honey bee, Biological Bulletin, 21, 249-264) was stimulated by the color vision paper. The methods were identical to the color vision paper with the exception that various patterns were used, as were colors. The use of patterns and colors is the first use, in my view, of compound conditioning methods so popular in contemporary studies of animal learning. The study contains 19 experiments and the results showed that honey bees can readily distinguish patterns. What we find disappointing about these honey bee studies is that so few behavioral scientists are aware of them. I doubt, for instance, that any reader of this article has heard of Professor Turner or his contributions to the study of honey bee behavior. In discussing the historical literature on honey bee behavior, Karl von Frisch (1923, 1967) and many contemporary writers on bee behavior never cited Professor Turner’s contributions. Professor Turner, however, cited the contributions of von Frisch and others. It is difficult to believe that von Frisch never heard of Turner  indeed Professor Turner was probably better known in Europe then in the United States. The honey bee papers appeared in 1910 and 1911, a full decade before the first von Frisch reviews. Interestingly, many consider the training of bees to fly to a target as distinguished by, for example, color or position, the “von Frisch technique.” It is obvious to anyone who reads the early literature that training bees to fly to a target was not developed by von Frisch. It is just this sort of lack of recognition that is so characteristic and so perplexing when we consider Professor Turner. The importance of Turner’s work was recognized by leaders in the animal behavior movement in the early 20th century. John B. Watson, for example, in considering a study on ant behavior, called Turner’s method “ingenious.” Turner’s work was also discussed by such well known scientists of the day as Margaret Washburn, E. L. Thorndike, T. C. Schneirla and Eugene-Louis Bouvier. Moreover, in the animal behavior literature of France a particular type of ant movement toward the nest is known as “Turner’s circling” in honor of its discoverer. Dr. Turner died at the home of his son Darwin Romanes Turner in Chicago, Illinois on February 14, 1923 at the age of 55 soon after his retirement from Sumner High School. In recognition of his outstanding achievements as a scientist, educator, and humanitarian the first school for African American handicapped children was named in his honor (Charles Henry Turner Open Air School for Crippled Children - Founded in 1925). Over the years several schools in an area of St. Louis known as “The Ville” bears his name. These include Charles Henry Turner Middle Branch (Founded 1954) and the new Charles Henry Turner MEGA Magnet Middle School for 6th  8th graders (Founded 1999). In 1962, Turner-Tanner Hall (now known as Tanner-Turner) at Clark College in Atlanta, Georgia was named in his honor. Readers interested in learning more about Dr. Charles Turner can find material at: The Infography, Fields of Knowledge. Biographical material and a selection of Dr. Turner’s papers can be found in Selected Papers and Biography of Charles Henry Turner (1867-1923), Pioneer of Comparative Animal Behavior Studies edited by Abramson, Jackson and Fuller (2003). It is available from The Edwin Mellen Press,Lewiston, New York. *The information on this page orginally appeared in the following article: Abramson, C. I. (2003). Charles Henry Turner: Contributions of a Forgotten African American to Honey Bee Research. American Bee Journal, 143, 643-644.
the express permission of Dr. Abramson, Ms. Terri Small-Turner, and Charles Henry Turner II. This website was designed and created by Caleb Lack, Ph.D., BaMF.